A portion of construction scaffolding collapsed today at Fenway Park. The Red Sox said no one was injured. The team is renovating the area behind home plate in what was formerly the .406 Club. 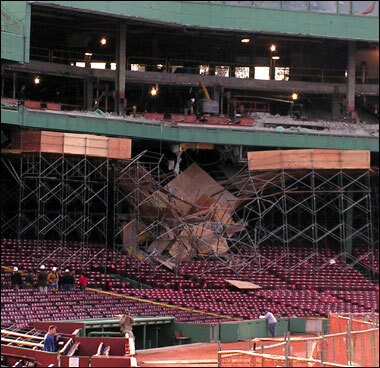 Pictures from the scene showed that the scaffolding fell in a heap onto the seats below the area behind home plate. Fire officials said the cause of the accident was unknown. Construction began last week on the .406 Club area. The team plans to open a new area in that spot, most of which will not be enclosed.